Place potato wedges in a large bowl. Add olive oil, paprika, parsley, chili, salt, and pepper and mix well to combine. Place 8 wedges in the basket of the air fryer and cook for 10 minutes. 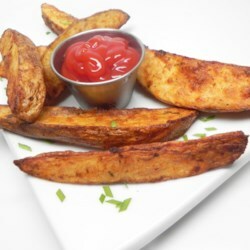 Flip wedges with tongs and cook for an additional 5 minutes. Repeat with remaining 8 wedges.